Ancient Greek in classical antiquity, before the development of the common Koine Greek of the Hellenistic period, was divided into several varieties. Most of these varieties are known only from inscriptions, but a few of them, principally Aeolic, Doric, and Ionic, are also represented in the literary canon alongside the dominant Attic form of literary Greek. 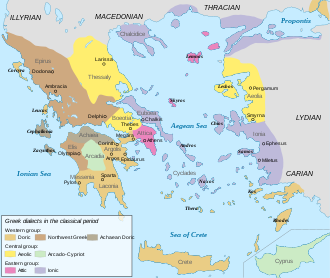 Likewise, Modern Greek is divided into several dialects, most derived from Koine Greek. The earliest known Greek dialect is Mycenaean Greek, the South/Eastern Greek variety attested from the Linear B tablets produced by the Mycenaean civilization of the Late Bronze Age in the late 2nd millennium BC. The classical distribution of dialects was brought about by the migrations of the early Iron Age after the collapse of the Mycenaean civilization. Some speakers of Mycenaean were displaced to Cyprus while others remained inland in Arcadia, giving rise to the Arcadocypriot dialect. This is the only dialect with a known Bronze-age precedent. The other dialects must have preceded their attested forms but the relationship of the precedents to Mycenaean remains to be discovered. Aeolic was spoken in three subdialects: one, Lesbian, on the island of Lesbos and the west coast of Asia Minor north of Smyrna. The other two, Boeotian and Thessalian, were spoken in the northeast of the Greek mainland (in Boeotia and Thessalia). The Dorian invasion spread Doric Greek from a probable location in northwestern Greece to the coast of the Peloponnesus; for example, to Sparta, to Crete and to the southernmost parts of the west coast of Asia Minor. North Western Greek is sometimes classified as a separate dialect, and is sometimes subsumed under Doric. Macedonian is regarded by some scholars as another Greek dialect, possibly related to Doric or NW Greek. Ionic was mostly spoken along the west coast of Asia Minor, including Smyrna and the area to the south of it, but also in Euboea. Homer's Iliad and Odyssey were written in Homeric Greek (or Epic Greek), an early East Greek blending Ionic and Aeolic features. Attic Greek, a sub- or sister-dialect of Ionic, was for centuries the language of Athens. Because Attic was adopted in Macedon before the conquests of Alexander the Great and the subsequent rise of Hellenism, it became the "standard" dialect that evolved into the Koiné. Ancient Greek literature is written in literary dialects that developed from particular regional or archaic dialects. Ancient Greek authors did not necessarily write in their native dialect, but rather chose a dialect that was suitable or traditional for the type of literature they were writing (see belles-lettres). All dialects have poetry written in them, but only Attic and Ionic have full works of prose attested. Homeric Greek is used in the first epic poems, the Iliad and the Odyssey, and the Homeric Hymns, traditionally attributed to Homer and written in dactylic hexameter. Homeric is a literary dialect with elements of Ionic, Aeolic and Arcadocypriot. Hesiod uses a similar dialect, and later writers imitate Homer in their epics, such as Apollonius Rhodius in Argonautica and Nonnus in Dionysiaca. Homer influenced other types of poetry as well. Ionic proper is first used in Archilochus of Paros. This dialect includes also the earliest Greek prose, that of Heraclitus and Ionic philosophers, Hecataeus and logographers, Herodotus, Democritus, and Hippocrates. Elegiac poetry originated in Ionia and always continued to be written in Ionic. Doric is the conventional dialect of choral lyric poetry, which includes the Laconian Alcman, the Theban Pindar and the choral songs of Attic tragedy (stasima). Several lyric and epigrammatic poets wrote in this dialect, such as Ibycus of Rhegium and Leonidas of Tarentum. The following authors wrote in Doric, preserved in fragments: Epicharmus comic poet and writers of South Italian Comedy (phlyax play), Mithaecus food writer and Archimedes. Aeolic is an exclusively poetic lyric dialect, represented by Sappho and Alcaeus for Lesbian (Aeolic) and Corinna of Tanagra for Boeotian. Thessalic (Aeolic), Northwest Doric, Arcado-Cypriot and Pamphylian never became literary dialects and are only known from inscriptions, and to some extent by the comical parodies of Aristophanes and lexicographers. Attic proper was used by the Attic orators, Lysias, Isocrates, Aeschines and Demosthenes, the philosophers Plato and Aristotle and the historian Xenophon. Thucydides wrote in Old Attic. The tragic playwrights Aeschylus, Sophocles, and Euripides wrote in an artificial poetic language, and the comic playwright Aristophanes writes in a language with vernacular elements. The ancients classified the language into three gene or four dialects, Ionic proper, Ionic (Attic), Aeolic, Doric and later a fifth one, Koine. Grammarians focus mainly on the literary dialects and isolated words. Historians may classify dialects on mythological/historical reasons rather than linguistic knowledge. According to Strabo, "Ionic is the same as Attic and Aeolic the same as Doric - Outside the Isthmus, all Greeks were Aeolians except the Athenians, the Megarians and the Dorians who live about Parnassus - In the Peloponnese, Achaeans were also Aeolians but only Eleans and Arcadians continued to speak Aeolic". However, for most ancients, Aeolic was synonymous with literary Lesbic. Stephanus of Byzantium characterized Boeotian as Aeolic and Aetolian as Doric. Remarkable is the ignorance of sources, except lexicographers, on Arcadian, Cypriot and Pamphylian. Finally, unlike Modern Greek and English, Ancient Greek common terms for human speech ( 'glôssa', 'dialektos', 'phônê' and the suffix '-isti' ) may be attributed interchangeably to both a dialect and a language. However, the plural 'dialektoi' is used when dialects and peculiar words are compared and listed by the grammarians under the terms 'lexeis' or 'glôssai'. The Ancient Greek dialects differed mainly in vowels. Loss of intervocalic s and consonantal i and w from Proto-Greek brought two vowels together in hiatus, a circumstance often called a "collision of vowels". Over time, Greek speakers would change pronunciation to avoid such a collision, and the way that vowels changed determined the dialect. The changes appear designed to place one vowel phoneme instead of two, a process called "contraction", if a third phoneme is created, and "hyphaeresis" ("taking away") if one phoneme is dropped and the other kept. Sometimes, the two phonemes are kept, sometimes modified, as in the Ionic poseideōn. A vowel shift differentiating the Ionic and Attic dialects from the rest was the shift of ā (ᾱ) to ē (η). In Ionic, the change occurred in all positions, but in Attic, it occurred almost everywhere except after e, i, and r (ε, ι, ρ). Homeric Greek shows the Ionic rather than the Attic version of the vowel shift for the most part. Doric and Aeolic show the original forms with ā (ᾱ). Attic neāniās (νεᾱνίᾱς); Ionic neēniēs (νεηνίης) "young man"
Another principle of vocalic dialectization follows the Indo-European ablaut series or vowel grades. The Proto-Indo-European language could interchange e (e-grade) with o (o-grade) or use neither (zero-grade). Similarly, Greek inherited the series, for example, ei, oi, i, which are e-, o- and zero-grades of the diphthong respectively. They could appear in different verb forms – present leipo (λείπω) "I leave", perfect leloipa (λέλοιπα) "I have left", aorist elipon (ἔλιπον) "I left" – or be used as the basis of dialectization: Attic deiknūmi (δείκνῡμι) "I point out" but Cretan diknumi (δίκνῡμι). The ancient Greek dialects were a result of isolation and poor communication between communities living in broken terrain. All general Greek historians point out the influence of terrain on the development of the city-states. Often, the development of languages dialectization results in the dissimilation of daughter languages. That phase did not occur in Greek; instead the dialects were replaced by Standard Greek. "… long after Attic had become the norm of literary prose, each state employed its own dialect, both in private and public monuments of internal concern, and in those of a more… interstate character, such as… treaties…." According to some scholars, Tsakonian is the only modern Greek dialect that descends from Doric, albeit with some influence from the Koine. Others include the Southern Italian dialects in this group, though perhaps they should rather be regarded as descended from the local Doric-influenced variant of the Koine. ^ Sometimes called the Greek Dark Ages because writing disappeared from Greece until the adaptation of the Phoenician alphabet. ^ Masson, Olivier (2003) . "[Ancient] Macedonian language". In Hornblower, S.; Spawforth A. (eds.). The Oxford Classical Dictionary (revised 3rd ed.). USA: Oxford University Press. pp. 905–906. ISBN 0-19-860641-9. ^ Hammond, N.G.L (1993) . The Macedonian State. Origins, Institutions and History (reprint ed.). USA: Oxford University Press. ISBN 0-19-814927-1. ^ Meier-Brügger, Michael; Fritz, Matthias; Mayrhofer, Manfred (2003). Indo-European Linguistics. Walter de Gruyter. p. 28. ISBN 978-3-11-017433-5. ^ Roisman, Worthington, 2010, "A Companion to Ancient Macedonia", Chapter 5: Johannes Engels, "Macedonians and Greeks", p. 95:"This (i.e. Pella curse tablet) has been judged to be the most important ancient testimony to substantiate that Macedonian was a north-western Greek and mainly a Doric dialect". ^ "[W]e may tentatively conclude that Macedonian is a dialect related to North-West Greek. ", Olivier Masson, French linguist, “Oxford Classical Dictionary: Macedonian Language”, 1996. ^ Masson & Dubois 2000, p. 292: "..."Macedonian Language" de l'Oxford Classical Dictionary, 1996, p. 906: "Macedonian may be seen as a Greek dialect, characterized by its marginal position and by local pronunciation (like Βερενίκα for Φερενίκα etc.)." ^ Sihler, Andrew Littleton (1995). New Comparative Grammar of Greek and Latin. New York, Oxford: Oxford University Press. pp. 10–12. ISBN 0-19-508345-8. ^ Two vowels together are not to be confused with a diphthong, which is two vowel sounds within the same syllable, often spelled with two letters. Greek diphthongs were typically inherited from Proto-Indo-European. Griechische Dialekte und ihre Verteilung, Titus site, in German. List, map, table of features. Dialects of Greek, Kelley L. Ross. Map and brief description. Excerpts from Margalit Finkelburg, "Greeks and Pre-Greeks: Aegean Prehistory and Greek Heroic Tradition" (PDF). (162 KiB). One of the topics is the origin of the dialects. Searchable Greek Inscriptions. A considerable corpus of ancient Greek inscriptions in various dialects published by The Packard Humanities Institute. Inscriptions Listed by Region, Centre for the Study of Ancient Documents site.